This log cabin has one bedroom plus loft and is only 1/2 block to the Lake Delton public beach. 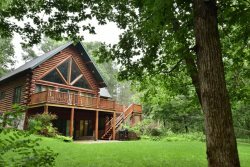 The cabin is equipped with a full kitchen, living/dining area with gas fireplace, cable TV, central A/C, full bath, 4-season log addition and charcoal grill. This is an ideal spot for vacationers who want to relax, yet it is only minutes from all the Dells attractions. Staff were very helpful and friendly throughout our experience. We loved how close the property was to main attractions, but yet it was far enough off the main streets so we were able to enjoy the quiet and relax. I also enjoyed having the kitchen to be able to cook. He, can't remember name, sorry, was wonderful! Always smiling, very helpful in where we needed to go. Great advice on food, etc. We had a great time! Our cabin was so convenient to the Dells, we were a half block from the parkway, but still felt in the country. Loved the inside as well as the outside. We have stayed at numerous properties over the years and have enjoyed everyone of them. We find dealing with the staff always a pleasant experience. We would never rent from anyone else. Relaxing and central to our travelling the area. Shan_gri_log was a wonderful accomodation for our family of five - kids ranging from 14 to 23. It fulfilled all expectations (although we thought it was more secluded), was very clean and close to all major attractions.